In every issue of our journal you will find Case of the Month which we will select among submitted ones. Everyone who is using Medical Massage protocols in their practice may submit their cases for the review and we will share with our readers the best one in every new issue. In the beginning of the 2010 our readers will vote for the Best Case of the Year and we will give prize to the winner! Our case of the month comes from New Zealand. What is interesting about this submission is the ability of the author to find a new and unusual solution to a common issue. Massage therapy is a great therapeutic tool for scar management. However, the scar treatment becomes a much more complicated issue when the practitioner faces scars formed as a result of severe burns. Second and third degree burns are accompanied by irreversible damage to the dermis layer of the skin. In such cases, the protective layer of the epithelium is not able to regenerate and disfigured scars are formed. 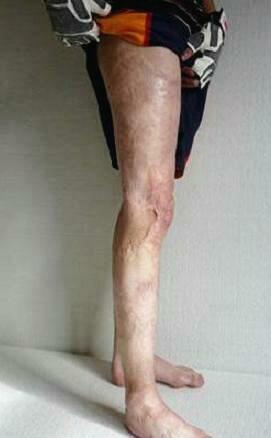 Very frequently the scars restrict motion in the neighboring joints and form contractures. While massage therapy is needed to soften the scars, at the same time the treatment itself becomes the problem. The very thin layer of scar tissue which covers the burned part of the body is very fragile. It does not matter how much lubricant the practitioner uses. The skin pattern on his or her fingertips may damage the thin layer of scar tissue during the repetitive massage strokes along the affected area. It may cause ulceration with long healing. This is why the author’s approach is such a great idea to use polished stones as a therapeutic tool to soften the scar tissue without compromising its integrity. At age 4 the client experienced severe burns on his trunk and upper and lower extremities. During his lifetime he had numerous surgeries to deal with the consequences of the burns. The client had undergone conventional physiotherapy treatments for his entire childhood and early adult life. The client complained about abundant scarification on the right lower extremity, left upper extremity and torso, and restriction of ROM in the right knee and hip joints. During the initial examination deep, dermal myofascial restrictions were detected in the affected areas, especially on the medial and lateral leg and anteriorly and posteriorly to the groin. The local palpation of the scars and underlaid tissue caused an overabundance of collagen deposits throughout the derma. These collagen deposits formed web like structures which increased tension during the active movements in the neighboring joints. The client went through seven weekly sessions of combined ScarsAway and Bodytool therapy in conjunction with Bodywall stretching. He was also advised about the intense home stretching program. The main therapeutic tool of the ScarsAway therapy was manufactured from a special type of Red Jasper. Approximately 3,000 prototypes of varying minerals and machined shapes were tested before the current product was produced. Dermal scaring is treated with the ScarsAway by drawing the tool laterally across the scar surface, sequentially working the rounded edge of the tool into both the lowest and highest points of the scars. The rounded domed surface of the tool provides for far more accuracy in locating the highest density points of scars or adhesions. These points have great clinical value because they represent the initial points of growth for the scar or adhesion. Restoring the elasticity of the scar tissue in these points has great impact on the entire web-like system of myofascial adhesions. We based the actual treatment protocol on Fascial Kinetics or Bowen technique, but instead of using thumbs or knuckles to trigger releases, the Bodytool made from Red Jasper was used. The combination of compressions and gliding strokes in the high density points as well as both the lowest and highest point of the scars, and finally the rest of scar surface in the combination with the mineral’s energy induces separation within the collagen helix. Restoration of the elasticity of the scar tissue or adhesions enhances vascular flow and the tissue regains elasticity, even during the first treatment. The video below illustrates the effectiveness of the treatment on two of our clients (the video on the right is the client from the discussed case). In the video on the left the immediate results of the treatment to soften scars is observed even by a member of the client’s family. This treatment greatly helps clients with the contractures formed as a result of excessive scarification. This was the exact case for the treatment of the client described here. Pictures in Fig. 1 show the client’s scars on the right lower extremity before and after the treatment. To enhance the outcomes of the treatment and speed up the client’s recovery we used Bodywall technology to stretch the scar tissue. ScarsAway treatment was used in combination with Bodywall (see video above). It allowed us to place the affected part of the body into the ideal position in regard to building up the tension in the scar tissue while the tool was used. The client has statistically significant improvements in ROM. Dermal adhesions have been reduced by over 60%. Scar tissue has been reduced by over 50% in height in relation to the surrounding derma. The skin surface of the damaged tissue regained elasticity, color and texture. Figure 2 shows the client’s ROM (knee flexion) before and after the treatment. The very high effectiveness of this therapy allowed Our Wellness at Work Clinic to operate on a “NO change, NO charge” basis, meaning all the modalities we have developed have had to be effective or we didn’t get paid. Chris was born in Australia and had a long and successful career in the motor and oil industries. In 1997, as a result of a yacht accident, he sustained numerous injuries. His rehabilitation included an intense massage therapy program which successfully solved his health problems. Initially, massage became an interest for him and subsequently it became a passion. Chris graduated from Wellpark College of Natural Therapies in 1998 and later worked there as a teacher. Chris also focused on other interests, including the development of Bodywall, Bodytool and ScarsAway therapies. Later he founded the wellness and massage clinic Wellness at Work, which has been a therapy provider for many major corporations, including Microsoft, IBM, Villa Maria Wines, Morgan & Banks, etc. A long list of elite athletes including current and past World and Olympic champions have been successfully treated in the clinic. Chris is qualified in Deep Tissue and Sports Massage, Fascial Kinetics, Chinese Reflexology and Lymphatic Drainage.